Today we had another exclusively breastfeeding day! Go Team Nurse T! Mr. T had two "firsts" today. So he had of course his first big bath at the hospital and second wipe down bath in the NICU, so today he got a washcloth bath at home. We used the bathtub his Uncle Ike and Aunt Becca gave him back at Christmas. It's a Primo Eurobath. What's nice about it is that it has two sides really... The infant lounger side and the sitting up toddler side. The infant side is molded the same shape as a car seat so they can lay in there without having you hold them or them having to hold their head up. Since his umbilical cord is still on, we weren't really doing water in the tub yet. Instead, I just used the tub to prop him up and then I used a clean, wet washcloth to clean him up. I laid a towel down in there so the cold bathtub wouldn't bug him. 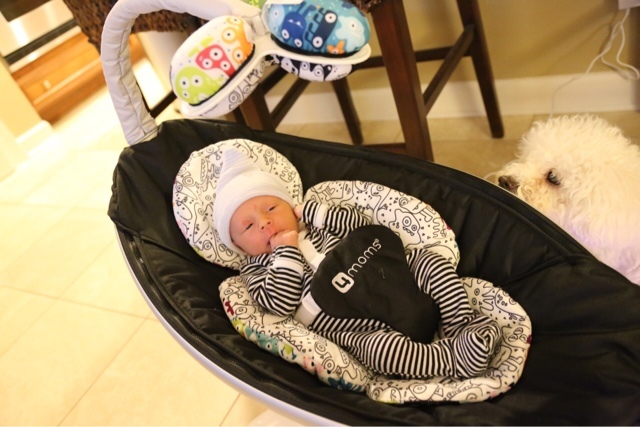 He was wide awake after eating around the time D and I should eat,so we tried the mamaroo. He seemed to be fine with it. I sorta felt the movement actually made him more awake, so I turned it off but left him in it. Still, It didn't make him sleepy.